In this project, you will learn how to make a Christmas pop-up card with a Christmas tree pop-up inside. The pop-up is a chain of decorated Christmas trees that is made like a paper doll chain. The project includes printable patterns for cards in two styles—one being fun and easy for children and the other being stylish and elegant for adults. Related craft: See the Thanksgiving Pop-Up Cards tutorial for another type of pop-up, the Birthday and Party Pop-Up Cards for balloon pop-ups and the Valentine with Pop-Up craft project for a chain of hearts pop-up. Choose the pop-up card you want to make. Download and print the pattern. Each card pattern has three pieces: the card and two Christmas tree pop-ups. Print the card pattern on cardstock and the optional "Card Insides" pattern on paper. 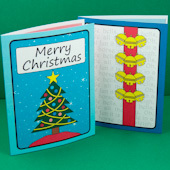 You can also make the card from paper by printing both the card pattern and the "Card Insides" pattern on paper. The final "bonus" pattern is for a set of separate pop-ups, including chains of teddy bears. 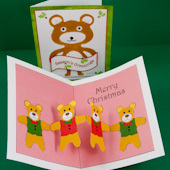 Use these pop-ups in any Christmas card, including Stenciled Bear Christmas Cards. 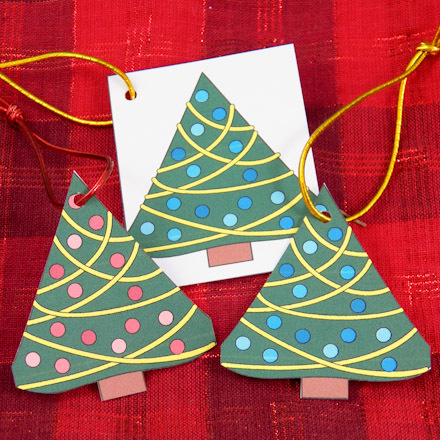 If you printed a black & white pattern, use colored pencils or markers to decorate the card, the card "insides", and the Christmas tree chain pop-up. Tip: You may want to write a message on the inside of the card now. Cut out each pattern piece on the solid black line. Try to make your cuts very straight. The card will look better and go together more easily with straight edges. For the "insides" card pattern, cut on the outer black outline for a paper card. For cardstock, cut on the inner black outline. Tip: The card "insides" is optional when making the card from cardstock, but it does add a finished look to your card. Tip: It is easier to make straight cuts with a craft knife and ruler. Kids, be sure to get adult help when using a craft knife! Fold the card in half on the center line with the design on the outside. For the "insides" piece, fold the colored side inside the fold. If you are using cardstock, it is best to score the fold lines first. If you are using the card "insides", glue it inside the folded card. Put glue on one half of the "insides" piece. Slide it inside the card. Press. Turn the card over, and put glue on the other half of the "insides" piece. Press again. 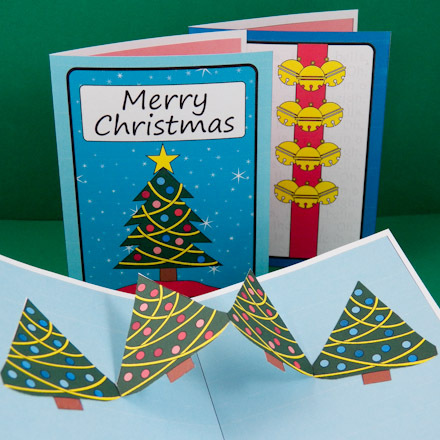 Tip: When making the card from paper, the outside and inside pieces are the same size. It is important to align the pieces exactly. The pop-up is a chain of Christmas trees. There are two pop-up strips to choose from. Select one and save the other to use inside another card or as gift tags. Tip: The pop-up with straight sides on the trees is easier to cut! The pop-up must be folded before cutting. Fold the pop-up accordion-style. First, fold the pop-up piece in half on the center line. The marked side is on the inside. This is called a VALLEY fold. Second, fold back each of the end trees on the lines. These folds are called MOUNTAIN folds. Hold the folded stack of trees together and cut carefully around the tree shape. Do not cut the folds where the trees meet. Unfold the pop-up and you have a chain of Christmas trees. You can decorate the Christmas trees anyway you like. You might add some glitter. Tip: For an easier pop-up, leave the trees uncut. Fold the tree chain the opposite way—VALLEY, MOUNTAIN, VALLEY. The colored sides of the trees are all on the inside. Leave the trees in this folded stack for gluing. Open the card flat with the inside of the card up. Put glue on the back of the last tree in the stack. Glue it about ½" from the right edge of the card. Be sure the MOUNTAIN fold is on the right. Next, put glue on the the back of the tree on the top of the stack. Fold the left side of the card over on top of the pop-up and press. Your card is now complete! Open it to see the pop-up. 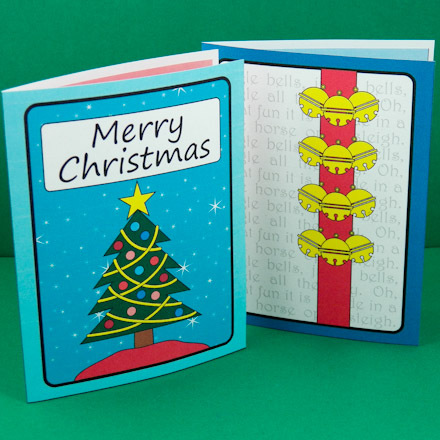 Tip: Choose from two designs for the Christmas pop-up card. 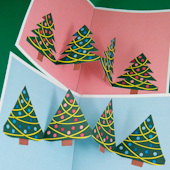 Tip: Each of the Christmas card patterns has two Christmas tree pop-ups. The one with straight sides on the trees is much easier to cut out. 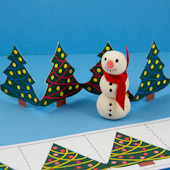 Tip: Use the Large snowflakes on blue ePaper to make bags that coordinate with Christmas Pop-Up Cards or line an envelope. This is the	second ePaper in the Winter Blue series, and goes with the Small snowflakes on blue ePaper. Tip: Use the separate pop-ups, either chains of teddy bears or Christmas trees, in any Christmas card—like the Stenciled Bear Christmas Cards. 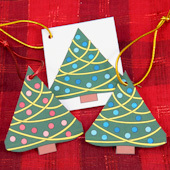 Tip: The leftover Christmas tree pop-up can be cut apart into gift tags for Christmas presents. Tip: Use the extra Christmas tree pop-up strip to decorate for Christmas! Doesn't it look cute with the little snowman? See how to make the snowman in the Christmas Ornaments, Magnets and Figurines craft project.